It had been a while since I’ve seen Born Yesterday but it’s a film I enjoy for a variety of reasons. 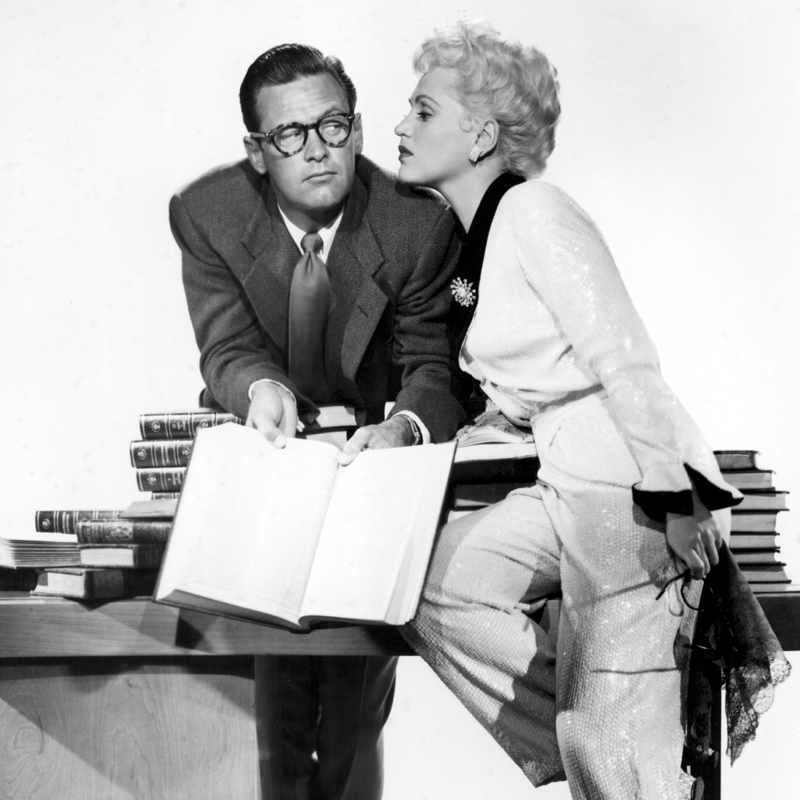 It’s a very smart comedy, Judy Holliday is irresistible, and William Holden! When I saw that it was one of the banner films for this year’s Turner Classic Movies Classic Film Festival I was very excited. Initially I thought what a great pick for a comedy theme since this it features the first ever comedic performance by an actress to be recognized with an Academy Award for Best Actress. But then I realized this film is just as important today as it was when it was released. Playwright Garson Kanin wrote Born Yesterday during WWII. Kanin was serving in the Office of Strategic Services (the predecessor to the CIA) making propaganda and war effort films. Having observed corruption in Washington, DC firsthand, Kanin was inspired to tell a serious expose about the influence of special interest groups on politics. Born Yesterday is about a ruthless, loud mouthed, scrap metal tycoon (Broderick Crawford as Harry Brock) who arrives in Washington to buy a Congressman or two in hopes of boosting his business. His entourage includes his former showgirl girlfriend who he believes is nothing more than a dumb blonde (Judy Holliday in the role of Billie Dawn). To make her more presentable in high society, he hires a reporter (Paul Varrell played by William Holden) to educate her. Immersing herself in American history with Paul as her guide, Billie (and the audience) comes to realize the power of manipulation at the hands of those who take advantage of vulnerable people for their own personal gain. Before it was put on film, Born Yesterday was a hit on Broadway, with Holliday originating the role of Billie Dawn. Holliday was practically an unknown at the time and the studio wanted Rita Hayworth to star in the film version. Hayworth was unavailable. Holliday got the part and an Oscar. Born Yesterday is one of the most important comedies to come out of the studio system. It shows us how creatives were unafraid to stand up to the greed they saw in the world with their art. Los Angeles-based movie critic Tara McNamara introduced the film at the Turner Classic Movies Classic Film Festival. She did an excellent job explaining the film’s relevance and enduring appeal. The film’s subtle take on corruption, lobbyists and outside influence in Washington is seen through its main characters. Harry Brock represents corrupt lobbyists while Billie Dawn is essentially the American people. The message: if we don’t educate ourselves on what’s happening, we’ll end up being the ones taken advantage of. The film was widely referenced during the 2016 presidential election with many pundits comparing Harry Brock to President Donald Trump. When I saw that Born Yesterday was one of the banner films for the festival, I was excited but a part of me wasn’t so sure I wanted to see it. The film features some very real themes and also a moment that is truly horrific. Born Yesterday plays like a tragedy compared to today’s current events as we continue to see the Harry Brocks of the world manipulate and rise to power. And yet, I’m glad I watched it with this audience. During some of the film’s more serious moments, you could feel the audience’s empathy for Billie Dawn. 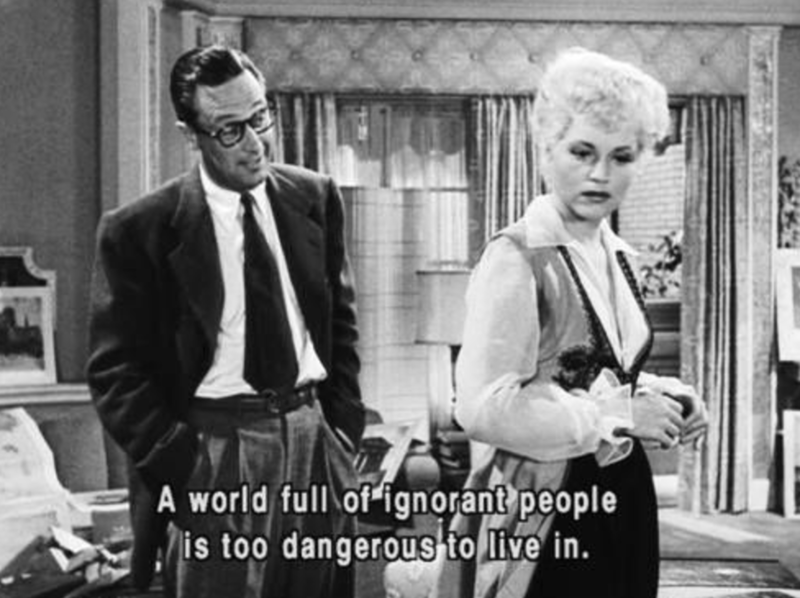 When William Holden’s Paul says the line, “A world full of ignorant people is too dangerous to live in,” the audience cheered and clapped loudly. It was a beautiful moment that reminded me there are still good in this world and people who believe the government is for and of the people. This isn’t to say that the makeup of the crowd were people who voted against Mr. Trump or to make any sort of political statement. I didn’t take some poll here and can not make that assumption. The fact that I don’t know the political leanings of the people in the audience is what makes TCMFF unique. Here things like race, gender, or social status—things meant to divide us—are ignored and we are all brought together by our shared love of classic film. No one judges or disrespects, everyone is there to celebrate the films we love so dearly. That’s the real beauty of film and the community TCM has fostered. The film version of Born Yesterday was released in 1950—67 years ago—with a prescient message we should have paid attention to. As long as the Billie Dawns and Paul Verralls of the world continue to stand up for what’s right, we’ll finally see the progress we so desperately crave. Great post. I’m not sure if this was my favorite screening or not, but if not it was right up there. It was my daughter Jasmine’s favorite hands down. I noticed the applause at the, a world full of ignorant people line. Great moment. I can see the comparison to Trump, but I think the corruption that Born Yesterday rails against is if anything more common place now than it was then, on both sides of the aisle. Great movie, that holds up extremely well today. Thanks Chris! And I agree with your sentiments wholeheartedly. To me, the fact that we’re where we are at in the world in terms of political corruption is what makes the film a bit of a tragedy in my eyes.